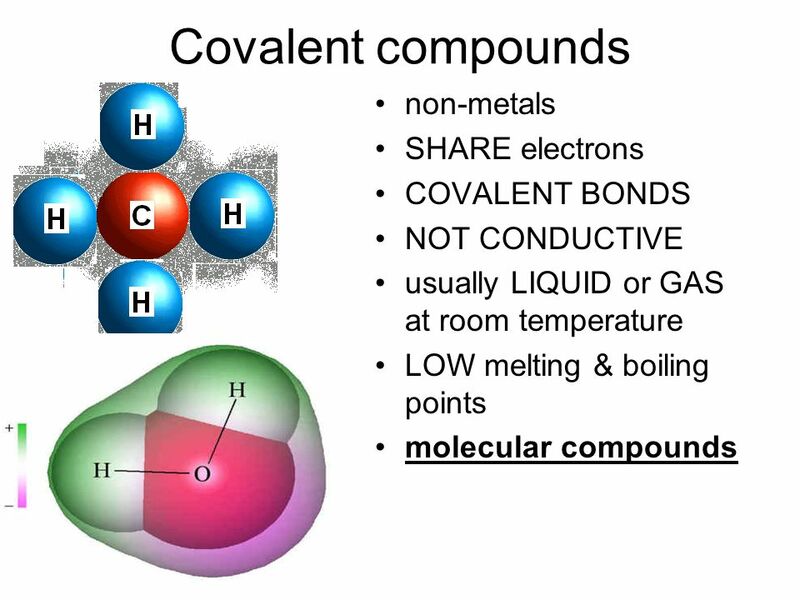 Download ppt "formula metal/ conductivity nonmetal H & O non metal none"
BONDING The joining together of elements in order to fill their outer shells. CH 4. 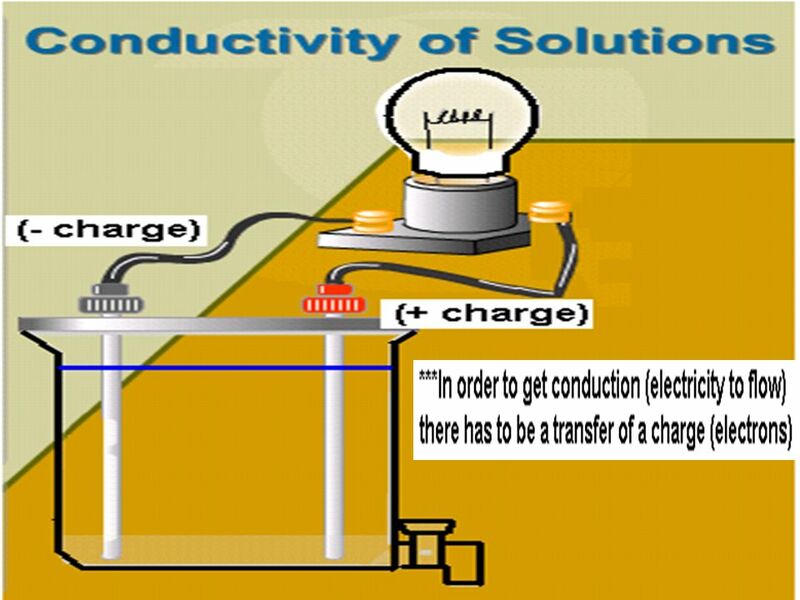  loss of valence electrons  gain of negatively charged electrons  name of the anion typically ends in -ide. 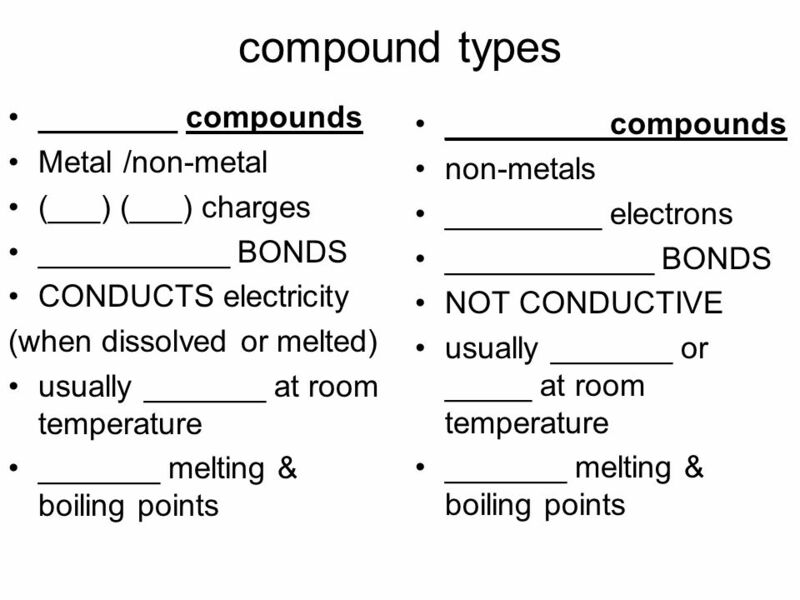 1 Chapter 4 Compounds and Their Bonds 4.2 Ionic Compounds Copyright © 2009 by Pearson Education, Inc.
After today, you will be able to… Write formulas for ionic compounds Explain what an empirical formula is List and explain the properties of ionic bonds.  Electrons are shared or exchanged between elements  This is an exothermic process (energy is released)  Both elements are more stable than they. Do Now 1.Define electronegativity. 2.What is a bond? 3.What are the THREE types of bonds? 4.What type of bond will form between… Na and Cl?? H and Cl?? 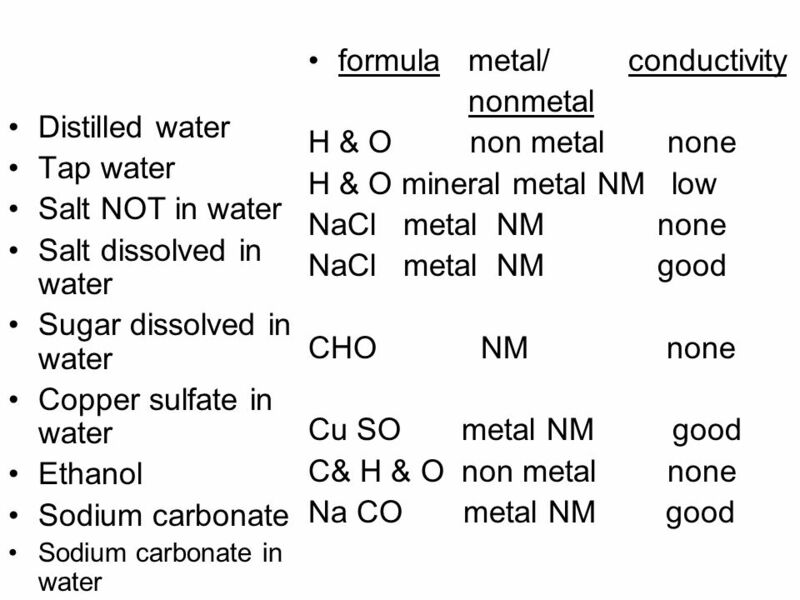 Intermolecular Forces and Physical Properties Chemistry Unit 6. Aim: What are molecular compounds? DO NOW: 1. 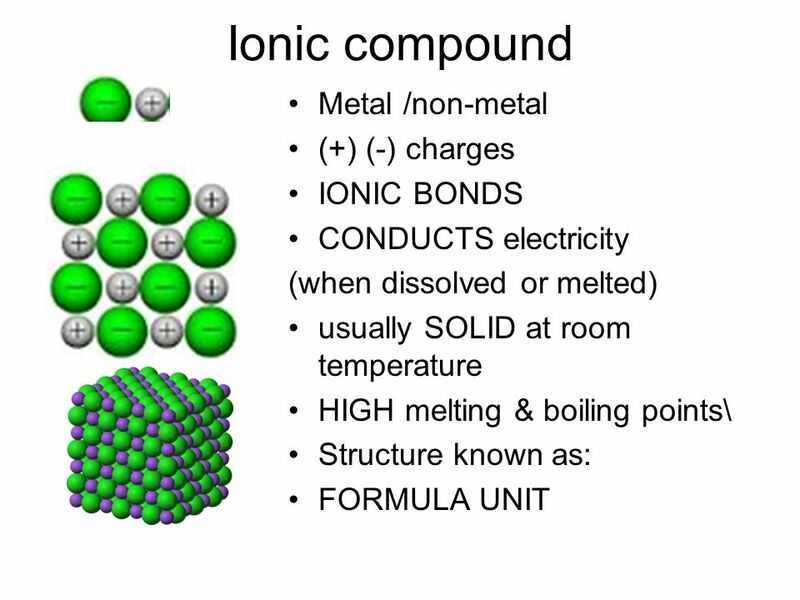 COMPARE AND CONTRAST METALLIC BONDING AND IONIC BONDING. 2. WHAT WOULD BE THE IONIC CHARGE FOR AN ATOM WITH. 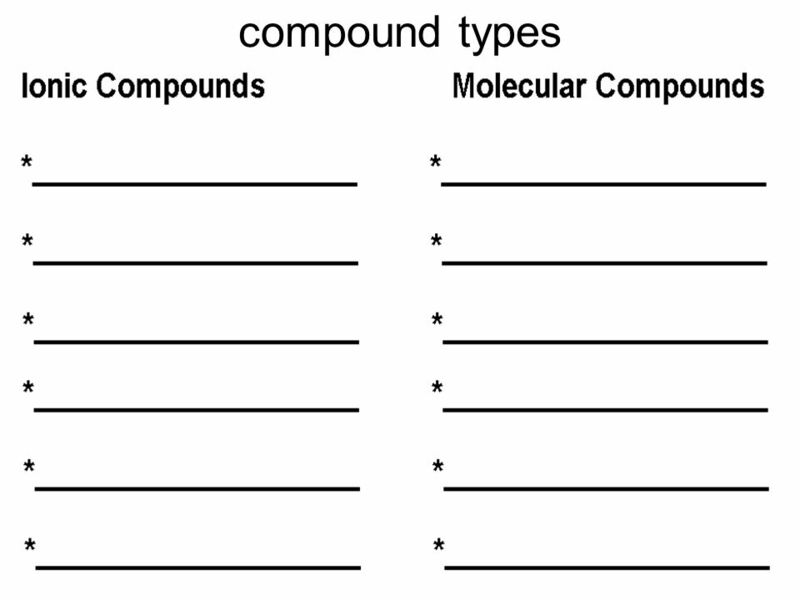 Chapter 3: Elements combine to form compounds Grade 9 Science: Unit 1: Atoms, Elements, and Compounds. Ionic/Covalent Bonding Notes. Stable or Unstable? An atom is only stable if it has a full valence shell If an atom is stable, it will not bond If an atom. Radiesha Vassell.  Bonds are two different atoms that have valance electrons. 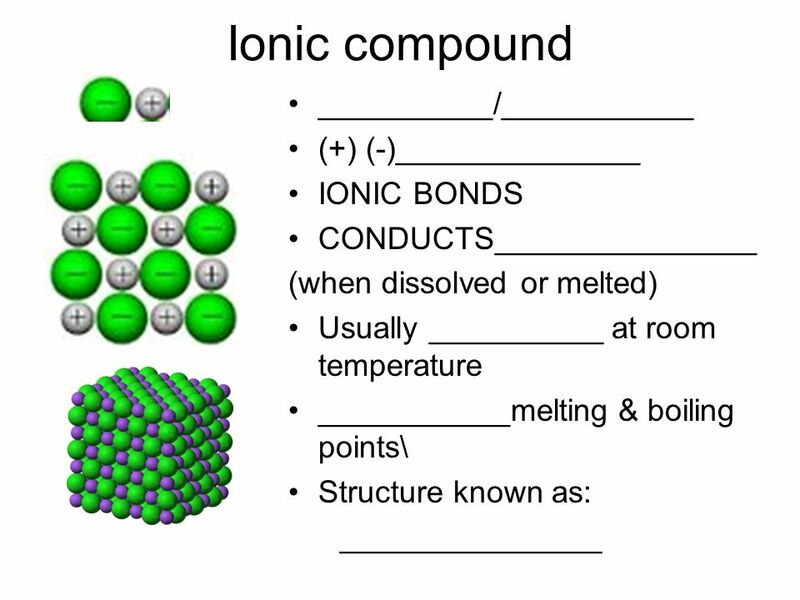  They are four different types of bonds… - Ionic ( non metal/metal atoms. Ionic Compounds Sodium Chloride ( table salt ) – NaCl – is an ionic compound. Ionic compounds are pure substances formed as a result of the attraction. 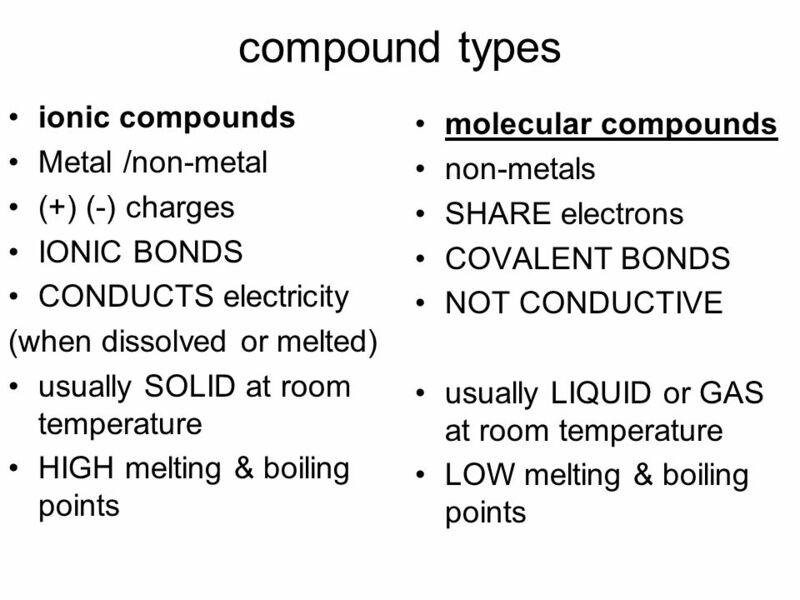 Bonding Types and Properties 1. 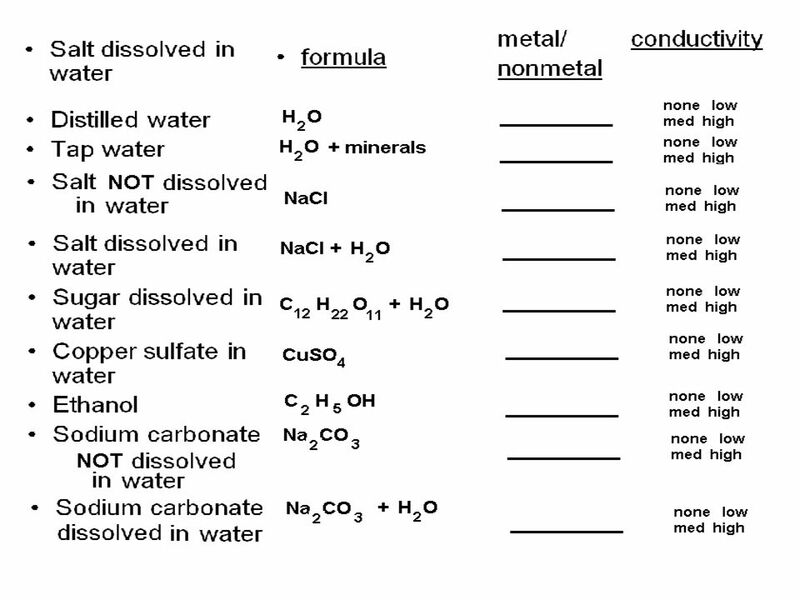 Identify compounds as ionic or molecular (covalent) based on ionic compounds being the combination of metals with nonmetals.